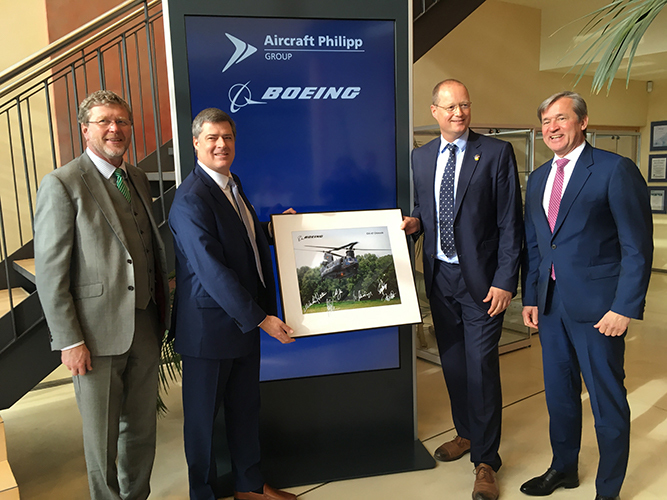 “I am very proud to sign the first contract with Boeing, to start another milestone in our company history and to continue according to our slogan: ‘Every flight a part of us’ - now also for the outstanding workhorse Chinook H-47!” said Rolf Philipp, CEO of Aircraft Philipp Group. To date, Boeing has delivered more than 900 H-47 Chinook helicopters that are in operation in 20 countries, including eight NATO nations -- Canada, Greece, Italy, Netherlands, Spain, Turkey, United Kingdom, and the U.S. -- allowing for increased interoperability between NATO nations during joint training and deployment operations worldwide. Aircraft Philipp Group GmbH is an owner-managed, medium-sized group company with over 50 years of experience in precision machining, manufacturing ready-to-install metal components and assemblies for the aviation and aerospace industry.